(Phys.org)—In the late 1800s when scientists were still trying to figure out what exactly atoms are, one of the leading theories, proposed by Lord Kelvin, was that atoms are knots of swirling vortices in the aether. Although this idea turned out to be completely wrong, it ushered in modern knot theory, which today is used in various areas of science such as fluid dynamics, the structure of DNA, and the concept of chirality. Now in a new paper published in Physical Review Letters, mathematical physicist Paul Sutcliffe at Durham University in the UK has theoretically shown that nanoparticles called magnetic skyrmions can be tied into various types of knots with different magnetic properties. He explains that, in a sense, these nanoknots represent a "nanoscale resurrection of Kelvin's dream of knotted fields." Skyrmions are the name of a general class of particles that are made by twisting a field. When this field is a magnetic field, the skyrmions are called magnetic skyrmions. Magnetic skyrmions have attracted a lot of attention recently due to their potential applications in spintronics, where electron spins (which are related to the electron's magnetic properties) are exploited in the design of transistors, storage media, and related devices. Magnetic skyrmions were experimentally observed for the first time a few years ago, in thin slices of magnetic materials—basically two-dimensional materials. By showing that magnetic skyrmions can theoretically be tied into knots, the new results move these particles from the two-dimensional world to the three-dimensional one. "The most significant point is that these nanoknots are stable, because usually fields avoid being knotted by untying themselves," Sutcliffe told Phys.org. Sutcliffe showed that the skyrmion knots can be characterized by the Hopf charge, which indicates the number of times that a skyrmion's curved magnetic lines are linked with each other. He showed that skyrmions with low Hopf charges tend to form rings, while those with higher Hopf charges form links and knots. Sutcliffe's investigation focuses on magnetic skyrmions in a particular type of magnet called frustrated magnets, which offer skyrmions an additional rotational degree of freedom compared to other magnetic materials. 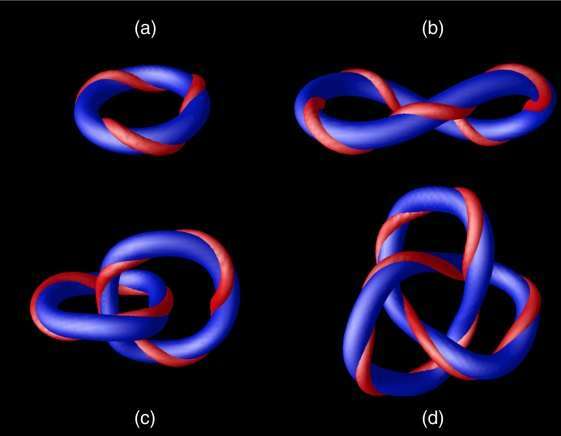 This flexibility gives skyrmions the extra room needed to be tied into knots. At the time Sutcliffe was writing his paper, no one had ever observed skyrmions in frustrated magnets. But as a testament to the fast pace of research in this area, just a few days after this publication researchers from China reported the first experimental observations of skyrmions in a frustrated magnet (arXiv:1706.05177 [cond-mat.mtrl-sci]). This result marks an important step toward realizing knotted magnetic skyrmions, and the next challenge will be to find a way to engineer the skyrmions into knots. Recent work on skyrmions has suggested that these particles may be controlled using optical vortex beams, arrays of ferromagnetic nanorods, and other methods. Researchers are also currently developing imaging techniques for skyrmions, which will be essential for the identification of these nanoknots. With new results on skyrmions being reported almost daily, Sutcliffe is optimistic about the prospects of creating skyrmion knots. "My future research plans in this area are concerned with studying the formation of these nanoknots, to help develop methods and suggest favorable conditions for experimentalists to create and observe these structures," Sutcliffe said. I remember some nutjob, a janitor or something, who'd concocted a similar theory of atomic structure. The article is about magnetic skyrmions, not some batshit crazy rejigging of a century old debate that hasn't been for a very long time. Just report Dingbat and don't feed the trolls. And read one of the much better sites that don't have every nutjub on the planet drooling their wisdumb every damned article. If you really want to save the world from self-impressed idiots, the EU convention is right around the corner. You can collar all the idiots you like. August 17-20, Phoenix. If confronting pseudo-science and outright fraud is really your passion, you must do it. If you settle for feeding the trolls on here, then you're just as sick, sad and sorry as they are.